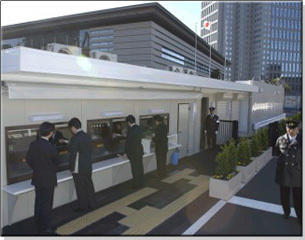 In addition to the Kantei being the building in which the Prime Minister, Chief Cabinet Secretary and the Deputy Chief Cabinet Secretaries perform their daily duties, it performs various other functions, being also the place where important Cabinet meetings take place, where foreign leaders are welcomed and dined, and also where a 24-hour crisis management response is coordinated. In addition, once the second phase of construction that is currently underway is completed, the Kantei will be finished, complete with the Official Residence that will provide living quarters for the Prime Minister. In order that the functions and roles of the Kantei are carried out smoothly, there are a number of people who support its everyday operations, such as persons responsible for the confirmation of entry and departure of visitors and visiting vehicles, guards, guides for visitors, persons responsible for the preparation and organization of meetings and ceremonies, persons responsible for cleaning and maintenance of facilities and equipment, and switchboard operators. An official doctor and nurse are always on hand to provide medical care for the Prime Minister. It is in this way that the Kantei functions smoothly on a daily basis, supported by these "people behind the scenes."